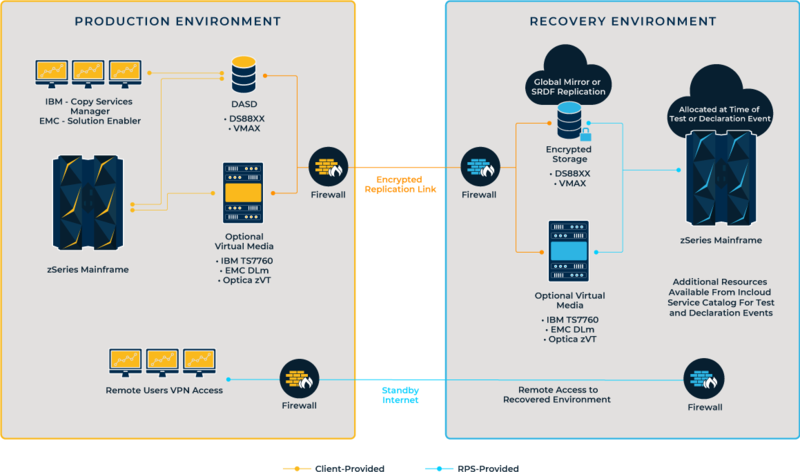 Recovery Point DRaaS for IBM Z Mainframe is a Disaster Recovery as a Service (DRaaS) offering that uses IBM’s Global Mirror replication technology and EMC’s SRDF replication technology to maintain identical data in both the source and target volumes to provide data protection and disaster recovery for all of your IBM Z workloads. The service replicates the data between two sites, over extended distances, and also forms consistency groups at regular intervals, allowing a clean recovery of your applications. Recovery Point DRaaS for IBM Z Mainframe provides a scalable, cloud-based storage replication solution that provides data integrity and data consistency with minimal performance impact on the applications at the primary site. It is implemented using either IBM DS8000 series or EMC VMAX series storage systems at both sites and can be augmented with replicated virtual tape backup solutions such as the IBM TS7760 and EMC’s DLm systems. Our flexible managed services options let you select the level of management you need, always supported by 24×7 direct access to Recovery Point’s highly credentialed staff. You can even select Managed Application Recovery services and we’ll orchestrate your recoveries completely and hand you back your applications, ready for login. And the best part is – we offer a no-cost proof of concept test so you can try before you buy. What is DRaaS for Mainframe?